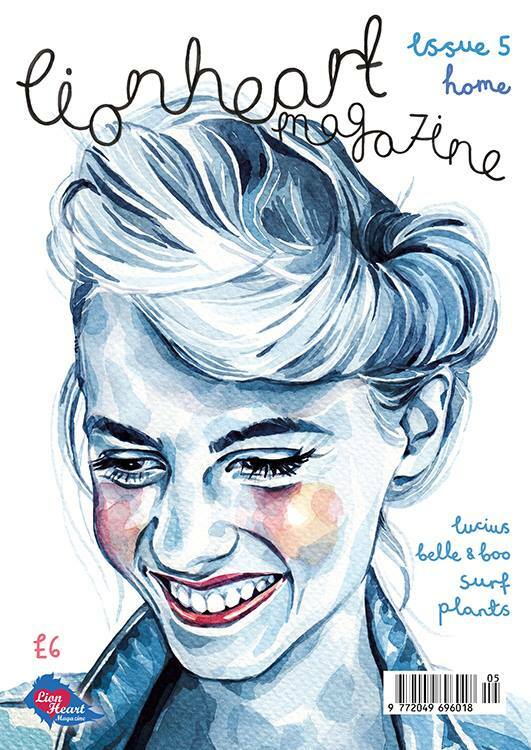 Lionheart Magazine, Home issue, 2014. Original article. 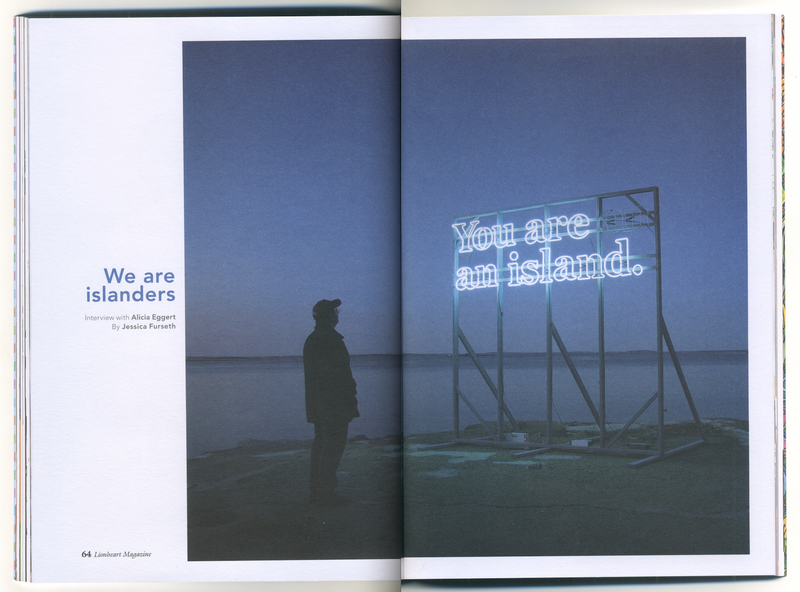 “You are on an island”, reads the sign, in bright white neon lights. Then it flashes, and suddenly the message is different: “You are an island.” It’s so simple, yet the philosophical implications are severe. And it’s not like Alicia Eggert hid this work away in some gallery. Instead she, along with co-conspirator Mike Fleming, rigged it onto a lorry and took it on tour, first in the US, then in Australia and the UK. Unsuspecting bystanders would get a dose of existentialism right in the face as the lorry drove up the High Street. Does Britain feel like an island? Or is it the the world that’s the island? The poet John Donne said it first: “No man is an island, entire of itself.” This is true, but don’t we each live alone inside our heads? Light and language are repeating features for Alicia Eggert, who lives in Maine, USA. Time is another, as several of her works have a kinetic element: watch the rotating blocks and every so often they spell out a word: “NOW”. Then it’s gone, but it will be back. A drum is rigged to sound out the number of heartbeats of the average person, and we know the instrument will “die” when the timer runs down. A clock has 12 functioning hands, so it’s always all the time. Asign in the middle of a beautiful scenery that reads “Panorama”. All of it is so basic, on the surface. But just on the surface, though, because where do moments go once they’ve happened? Why do we forget that life isn’t a state but a motion? And what is time anyway? See, that’s what Alicia does: she gets you going. Jessica: Your work is based on strong, clean ideas. Is it important to you that the viewer gets what you are trying to communicate? Alicia: It has always been very important to me that my work can be understood by all people on at least some basic level. As a conceptual artist, my work always begins with an idea, and the materials I work with are chosen based on their ability to communicate a concept as clearly and concisely as possible. I think this is why text has become one of my primary sculptural materials. Words are like found objects – they are easily recognisable and accessible to anyone who speaks the same language and has the ability to read. But single words can have many definitions, so they also have the ability to possess great depth and complexity. One word can be both simple and profound. My art practice is founded on my own sense of wonder, and my personal goal is to create works of art that inspire a sense of wonder in others. J: Time is a recurring topic for you. It feels like time passes at a different pace depending on the situation – I realise that’s impossible, but I’m not always convinced. A: I think each one of us lives in our own little time universe. Some people live at a significantly slower or faster pace than the majority, usually without even realising it. Culture is definitely an influence, but I think it’s more individual than that. Time varies from person to person. J: “You are (on) an island” – I love this. Do you think living on a massive continent like the US, as opposed to an island like Britain, makes people different characters? Or is being an islander a state of mind. A: This work can be interpreted very literally when shown on geographical islands, but I think people can also live on metaphorical islands … ideological islands or political islands. I can never really know what it’s like to be an islander in the literal sense, since I was born and raised in the US. But what I love most about this sign is the way that it forces you to zoom out and consider the bigger picture. Even continents are islands on a planet whose surface is 70% water. And if you zoom out even further, our planet is an island in a vast universe. The sign highlights the sense of isolation we all sometimes feel as individuals, but it also emphasises how that feeling is something we all have in common. J: Does working with the same ideas across several projects feel satisfying? Or is it frustrating because the questions are never fully answered. A: It’s actually very satisfying. Because I’m not trying to answer any questions. I’m trying to figure out a better way to ask them. Posted on 06/22/2014 by Jess. This entry was posted in Art writing and tagged alicia eggert, art, interview, lionheart magazine. Bookmark the permalink.